Hello, most probably disappointed tifosis. You might be thinking I am a little down in my mouth for not scoring an opening race win in Australia, but that would be not true or correct, either. Obviously we should have been in a position to earn the maximum points for our first outing, but it is not all disasters and head shaking at Scuderia Marlboro Ferrari. First of all the biggest disaster for me would have been a win for Rubens and zero points in my bag, so that terrible scenario is not happened for a start. If you would take an extreme view you could blame Bridgestone for our result. "Why?" I hear you question me. As I have said many times, we have so much faith in our Japanese Bridgestone intermediates we had no need to start our race on the grooved slicks. It is only because the French rubbers are so unreliable that Juan and the others switched so early. You may not think it was such a record-breaking weekend for me, but again you would be wrong. I have achieved another potentially award-winning long sentence that already must be the front-runner, in the Sentence of the Year competition for 2003* (see Tagebuch 16). This was in our Saturday press conference. "I guess it is far more difficult for the team because to adapt to the timeframe we have to work currently when things are very tight and as you can see, we finished the warm-up at 2.45, and at three o'clock everything has to be ready for the race and then it is very tricky and there are certain things and I guess some adaptation will be necessary for the future, but in general I shouldn't complain." Yes, a whole 13 words in excess of my showboater of 2002, clearly a good starter in anybody's book. I am having a good laugh at many events we are staging with sponsors and publicity throughout our time in Australia. 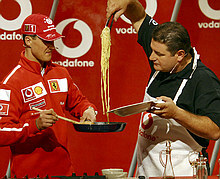 One of them was a Vodafone pasta cooking demonstration in which we prepared Vodafone/Schumacher Linguine aglio e olio. "My love of racing is well known but not everybody knows how passionate I am about Italian cuisine. It was fantastic to be able to combine both of my passions today!" ...is the kind of thing I am saying in a very official way. Somehow Lieblings doughnut got to see this in a German newspaper and told me I had missed one passion out. Yes, of couse she is right, Tuesday night vroom vroom! 'We still can talk for long hours. At free weekends we often sit together into the bath-tub and talk about our days, what has happened to both of us. Kind of beautiful without going too far, don't you think? Too much listening to grunge metal heavy rock guitar albums is making him more deaf than a Scorpions guitarist. I asked Sabine to look out a hearing aid and I will send it to him, before the race in Malaysia, with a small note. I am most amusing about the thought of this and his face on reacting as such. Perhaps I should give him the gift in the Drivers' Briefing? That would be very funny indeed. *The German Society for the Preservation of the Very Long Sentence awarded me their Companion Of Honour for my work at FIA press conferences in 2002.